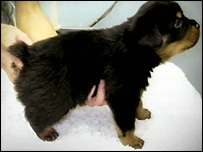 A Brighton woman has pleaded guilty to docking the tails of eight Rottweiler puppies with a pair of scissors. Gillian Breden, 51, of Grove Hill, Whitehawk, faced eight charges of removing dogs' tails with no genuine medical reason. 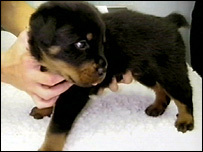 The court case followed an investigation by Brighton council and the RSPCA. Sentencing of Breden was adjourned to 11 September because of the severity of the case, Brighton magistrates said. In court, Breden claimed she did not know it was illegal to dock the tails of her animals. Adjourning the case, magistrates told Breden they needed time to consider a custodial sentence. Outside the court, Maggi Holland, from Brighton council, said a jail sentence was not "too harsh". "I don't think it's too harsh for what she did to those poor little puppies. "It must have been agony for them." Ms Holland said each charge carried a maximum sentence of up to 51 weeks in prison or a £20,000 fine. And magistrates had the power to disqualify the defendant from keeping dogs and remove any animals still in her care, she added. Vet Marc Abraham told BBC South East: "Tail docking in puppies is extremely painful. "They scream. They bleed a lot. You are actually cutting through bone. "In every situation I've come across, the mother has to be taken well away from the puppies, because she will get distressed too."